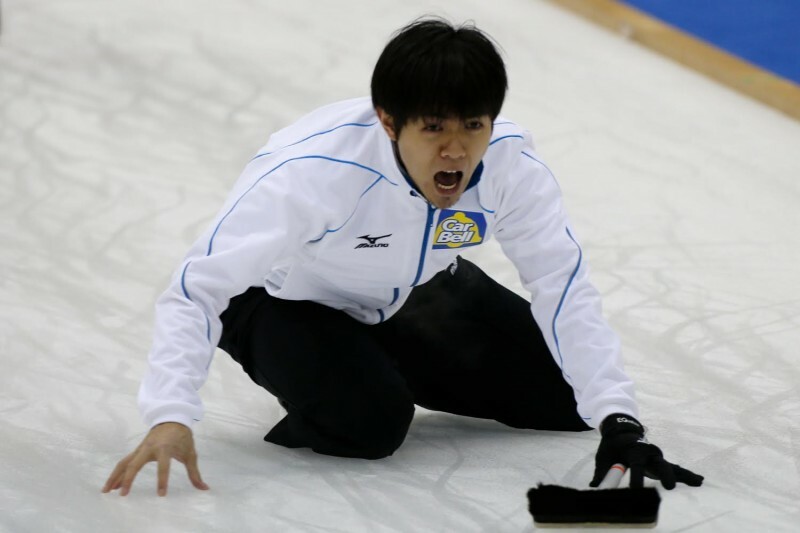 Japan men and Korea women have qualified for the gold medal games at the Pacific-Asia Curling Championships 2014 after both winning their semi-final series this morning. Japan’s win also qualified their nation for the Ford World Men’s Curling Championship 2015 being held in Halifax, Canada in April next year. Karuizawa Ice Park Curling Hall played host to the semi-finals which saw the women play a best of five series, with the first two games of their double-round robin counting as the first two results of the series. The men’s semi-finals are a best of three series, with their game against one another in their round-robin counting as the first results of their semi-final series. As such, Japan’s men had already beaten Australia in the round-robin, therefore only needing one more victory to win their semi-final series. After Japan took a one point advantage in the first end, Australia took the lead in the second end when skip Ian Palangio drew into a packed house to score two points. The next end provided what was one of the shots of the Championships so far when skip Yusuke Morozumi made a raise takeout to score three points. Japan then stole another point in the fourth end as Australia’s Ian Palangio attempted a tap up but moved one of the Japanese stones into the scoring position instead. The Australian skip did however take one point back for his team as he drew into the house in the next end, making the score 5-3 at the fifth end break. Australia kept looking for a big score to get back into the game but Japan managed to see it out as they ran Australia out of stones in the tenth end to win 6-4. Korea women meanwhile qualified for the gold medal game as they kept their unbeaten record intact at this Championship as they defeated New Zealand. Having beaten New Zealand twice in the double round-robin, Korea picked up their third win of the semi-final series, by in large thanks to a big score in the seventh end when skip Eun Jung Kim drew into the house for three points to take a 8-4 lead. Korea then went on to win the game 10-7 after nine ends of play. In the other men’s semi-final, Korea had a one game series advantage over China having beaten them in the round-robin. One more win would have sealed their place in the gold medal game and a place at the Ford World Men’s Curling Championship 2015. China however had their sights on the medals and World Championship qualification as well. With so much on the line, this game proved to be tight. However, China managed to steal three single points in the sixth, seventh and eighth ends which proved to be crucial. With the score tied at 6-6 going into the tenth end, China skip Jialiang Zang drew onto the button with his last stone to score two points against a Korean counter, to take the 8-6 win and tie up their best of three series 1-1. Those two teams will return to the ice this afternoon along with China and Japan women who were also in action this morning. With both China and Japan having beaten each other in the double round-robin, their best of five games series was tied 1-1 going into this game. By the fifth end break, China were leading 3-2 before the game was levelled in the ninth end when Japan skip Ayumi Ogasawara made a draw for two points. Like their men’s team, China held their nerve as they took the one point from the final end to seal a 7-6 win and take a 2-1 series advantage into their next semi-final game this afternoon. If China win that then they will play Korea in the gold medal game, but if Japan win then a third semi-final game will be required between the two teams this evening. Japan have already qualified for the World Women’s Curling Championship 2015 as host, therefore the winner, or the runner up if Japan is winner, will also qualify for the Women’s World Championship. Both afternoon semi-finals, featuring China v Japan (WCTV webscast) women and Korea v China men, begin at 14:00 local time (JST).